DIAL: Black matte dial with three registers tachymeter scale. T above register at 6 o'clock. Baton hour minutes hand and red lollipop chronograph seconds hand. CONDITION REPORT: Excellent overall condition. The dial lume has aged with a nice patina and matching hands. The case in unpolished. An overall stunning piece. 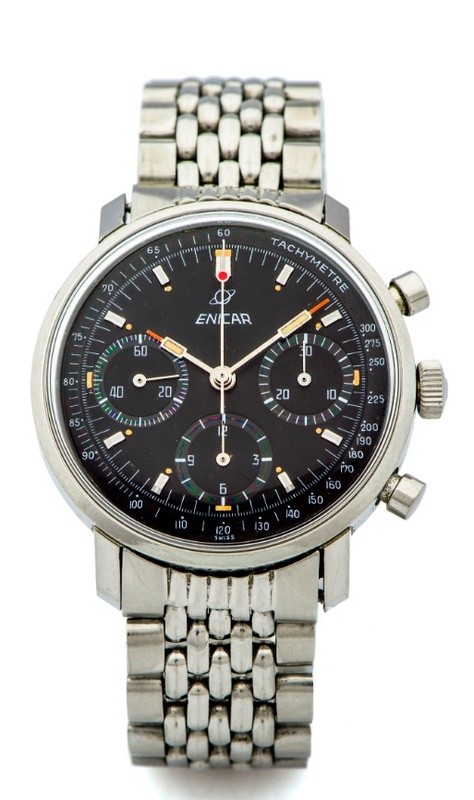 Notes: This Enicar chronograph has been called pre-Sherpa and dated back to 1955 by some, but with the printed white logo and the presence of a T on the dial denoting tritium, this is impossible. It is most likely a transitional model from the mid 1960's with the new logo and the absence of a model name. In any case, this model is very rare and the size (Smaller than typical sherpa) is very well proportioned.